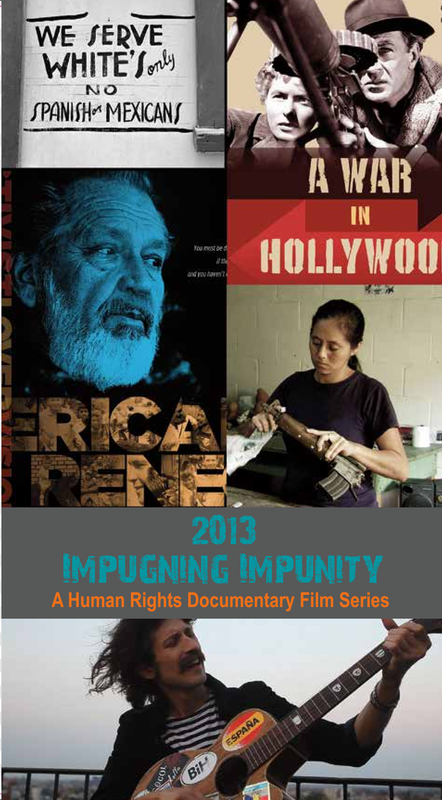 ALBA is pleased to present Impugning Impunity: A Human Rights Documentary Film Series, which will be held from November 22-24, 2013 at Pace University in the Multipurpose Room, 3 Spruce Street New York, NY 10038 (press release here). Now in its third year, this annual film series activates a community-wide dialogue on human rights issues through the presentation and discussion of acclaimed documentaries exploring topics such as governmental abuse of power, historical memory, civil rights and racial inequality. The selected documentaries include eight powerful and inspirational films from across the globe. Among these are Sundance Film Festival Winner “Dirty Wars” written by Jeremy Scahill; Icarus Film Festival Winner, “The Tiniest Place” by Tatiana Huezo; and the New York premiere of “The Land of Ebb”, Toronto International Film Festival Official Selection Winner, directed and produced by Andrew Williamson. The 2013 program also includes a number of Q&A sessions with the directors directly after the screenings. On Saturday November 23rd at 7:30pm, we will be joined by filmmaker Peter Miller and Advocacy Program Manager at the Center for Constitutional Rights, Leili Kashani, for a discussion of “ISN 310: Djamel Ameziane’s Decade in Guantanamo” and “A Class Apart.” Additional guests include Scott Garren (An American Renegade) and Antonino D´Ambrossio (Let Fury Have the Hour). ALBA is an educational non-profit dedicated to promoting social activism and the defense of human rights through educational programs. Underscoring ALBA’s commitment to uphold the values of the American volunteers who fought fascism in the Spanish Civil War, each film was selected on its capacity to inform and incite social activism and the defense of human rights. The film series focuses a wide-lens on contemporary modes of injustice and serves to realize ALBA’s vision to highlight and support human rights activism. Impugning Impunity is made possible with the generous support from ALBA’s community partners, including the Puffin Foundation, the Department of Political Science at Pace University, and the Center for Constitutional Rights; with support from the New York Civil Liberties Union, The New Press, Veterans for Peace and Ambulante. Individual events are $10 for the general public and $8 for students. Weekend Passes are available for $35. Click here for a press release and program.